Most marketers, however, focus on the “sexier” first half of the journey, turning prime suspects into net-new customers, while retention gets lost in the process, according to a new report composed by Corporate Visions, in partnership with Demand Gen Report. The State of the Conversation Report surveyed 400 organizations and shows that 80% of companies spend more than 70% of their budget on demand generation messaging and content. Less than 30% is spent on customer retention or upsell/cross-sell activities at those companies. In fact, 42% of companies invest less than 10% of their marketing budgets in renewal and upsell/cross-sell efforts. Per Riesterer, only 19% of companies have marketing as the primary/exclusive owner of renewal messaging. 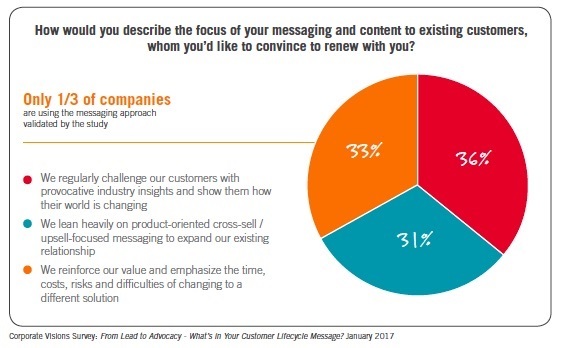 Where there is fragmented ownership around the renewal story, there is also missed opportunity in messaging strategy. The survey found that 58% of respondents don’t see a need for message distinction between demand generation and retention/renewal business. This is a critical point, since new research shows that failing to distinguish between these messages could set your renewal conversations back—significantly. Preference stability—Make a point of reminding customers of the long, hard process they went through to make their original buying decision. This will reinforce their natural tendency to keep their previous decisions and preferences stable. Perceived cost of change—Walk customers through the startup costs that have now been returned through improved performance and are now “sunk” and functionally and part of the ongoing operating budget. Anticipated regret and blame—Remind customers of the time and resources it’s taken to ramp up the solution they bought, onboard all their people, manage the changes and get the implementation running smoothly. Selection difficulty—Willingly admit that most other solutions on the market provide a similar set of capabilities and that the offerings haven’t changed much since their original decision; also, that you’ve kept them updated throughout your journey together. People are less likely to consider change if they don’t discern contrast between alternatives. Riesterer stressed that as companies fine tune ABM and customer lifecycle strategy, they should consider distinct renewal messaging strategy that is the opposite of acquisition strategy. Instead of challenging the customer, you need to reinforce your value to enhance loyalty, he concluded.